I've always been just a little frightened of Alice Cooper. The younger Alice I mean. All that make up and scowling sent shivers through me. All I new about Cooper and his music was the School's Out album and the No More, Mr. Nice Guy single. There were no music videos, and I didn't have television even if there were, and I didn't grow up in this country. However, he has always held a strange fascination for me, and I was looking forward to learning about this man (I knew nothing of his life) and how a rocker turned into a golfer. And rocker he was, in the true sense of the word, snake and all. 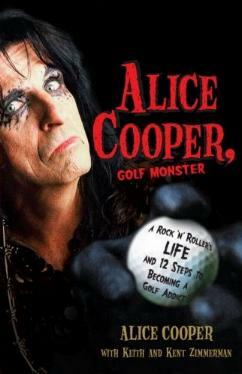 In his book he tells about his addictions (some harmful) and his life as a rock star, and of course, about his golf. Profoundly, he says, "If rock 'n' roll made my life, then golf saved my life." He was lucky. His "normal" childhood included a stable family life, moving around a lot, being a track star, loving baseball, and eventually getting into music, mostly through immitating the Beatles and Mick Jagger. His fame wasn't instantaneous and they paid their dues like most up-and-coming bands, but they made it through sheer detemination. He relates endless stories of who he's met and/or worked with, and it's an impressive list. Anyone from Dalí to Lennon or Jim Morrison to Vijay Singh or Tiger Woods. Who would have throught golf would become another "addiction"? So much so that he plays every day, and is the spokesman for Callaway Golf. Also, Cooper is the founder of the non-profit goodwill foundation, Solid Rock. Alice Cooper as you probably know, is not his real name. And it was hilarious that he knows what a Ford Anglia is. We had one too. I was more than impressed that Cooper says he's never cheated on this wife of more than 30-odd years. Bravo. Conclusion - I can't believe I missed this book when it first came out! I found it uplifting and surprisingly interesting.